A Carefree resident and a former Vice Chairman of the General Electric Co. has made a substantial gift to the Heard Museum of Native Cultures and Art, museum officials announced [Friday]. Jack S. Parker, 94, donated a $1 million cash annuity as well as his extensive collection of American Indian art estimated at $1.6 million, officials said. The donation is the culmination of Parker’s long-standing support of the museum, which exceeds more than $3 million. The most recent gift was marked with a gala celebration in Parker’s honor and the renaming of a museum gallery this past month. Now called the Jack Steele Parker Gallery, the gallery formerly was known as the Compas gallery and is home to the “Around the World: the Heard Museum Collection,” and includes items from Africa, the Americas and Oceania. The donation was made through the Maie Bartlett Heard Society, the name of the museum’s planned giving program. 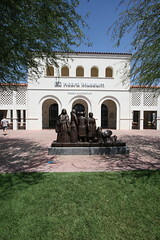 Posted on December 13, 2010, in Arts and Culture and tagged Herad Museum, Midtown Phoenix, Museum. Bookmark the permalink. Leave a comment.